Buy 124 or more for $3.32 each. In keeping with the inquisitive spirit of their times, two 17th-century writers envisioned their own philosophical and intellectual utopias. 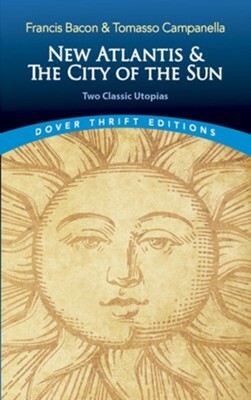 Tomasso Campanella, a Calabrian monk, published The City of the Sun in 1623, and Francis Bacon's The New Atlantis appeared in 1627. Campanella was a student of logic and physics; Bacon focused on politics and philosophy. Despite differences in setting and treatment, both authors employed the latest methods of scientific experimentation to restructure the social order, and both works abound in imaginative thought and expression. Campanella formulated the first scientifically based socialistic system — one that furnished a model for subsequent ideal communities. Bacon focused on the duty of the state toward science, and his projections for state-sponsored research anticipated many advances in medicine and surgery, meteorology, and machinery. Both of these classics mirror their period's idealism and its revolutionary trends in thought. Statesman and philosopher Francis Bacon (1561–1626) was a towering figure of the English Renaissance best known as a champion of the empirical, inductive approach that forms the foundation of the modern scientific method. Bacon's political career culminated in his appointment as Lord Chancellor. Dismissed from his post on charges of corruption, he retired from public life and devoted himself to study and writing. Dominican friar Tomasso Campanella (1568–1639) rejected Christian revelation and sought truth in reason and nature. An ardent defender of Galileo and his philosophy, Campanella was imprisoned and tortured by the Inquisition. During his 27 years of confinement, Campanella reverted to Roman Catholic orthodoxy and was ultimately freed by papal intervention. I'm the author/artist and I want to review New Atlantis and The City of the Sun.